Anyone who knows me fairly well is aware of the fact that I not only have a tremendous love of cinema but of theatre. My infatuation with the stage came in high school when I was cast in four (count ‘em, four) roles in a production of Nicholas Nickleby. That’s when I was, as the saying goes, “bitten by the bug,” and ever since I’ve taken as many opportunities as I can to participate in local plays as an actor or director. One of the highlights of my theatrical “career” was playing Motel the tailor in a production of Fiddler on the Roof during my mid-20s. It was not the first time I’d been involved in a staging of this show, having helped out with a production done by my old high school a few years earlier. It was also not the last time I would ever see it performed on stage since my fellow cast members and I attended another production of it about a year later. Needless to say, it’s a show with which I am very familiar. It has been, for a long time now, one of my favorite musicals, and it all began with my exposure to the 1971 film. I watched it at a young age and fell in love with it immediately. It has become one of my favorite movie musicals and in celebration of its 40th anniversary today, I thought I’d share a few thoughts on it. Fiddler on the Roof began as a series of stories written by the “Jewish Mark Twain,” Sholem Aleichem, and published in 1894. They told of a poor milkman named Tevye and his hardships dealing with his six daughters. The stories served as the basis for several plays in both English and Yiddish as well as a 1939 film simply entitled Tevye. However, in 1964 playwright Joseph Stein, along with composer Jerry Bock and lyricist Sheldon Harnick, created what would be the most popular incarnation of this story as well as the most successful and beloved Broadway musical of its day. It was a foregone conclusion then that it would eventually become a big-screen musical (in a time when Hollywood was still making those), and so in 1970 United Artists hired director Norman Jewison to adapt the musical. Having directed such gritty, mature films such as The Thomas Crown Affair, In the Heat of the Night and The Cincinnati Kid, he seemed an odd choice to bring such family friendly fare to the screen. (Indeed, the story goes he was chosen because the producers mistakenly thought he was Jewish.) As luck would have it, however, it was an inspired choice. 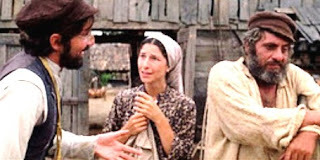 People tend to forget that while the first half of Fiddler is bright and joyous, the second half is darker and more melancholy, and while the tone of the second half seems more in keeping with Jewison’s sensibilities, he actually handles both halves with incredible deftness. 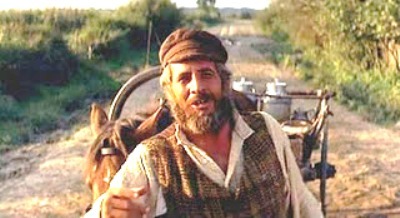 Jewison’s first stroke of genius was casting the Israeli actor Chaim Topol in the lead role of Tevye. The choice was somewhat controversial because, although Topol had played the part in London, the great Zero Mostel originated the role on Broadway (even winning a Tony for it) and was expected to reprise it for the film just as he had done with the reprisal of his other Tony Award-winning performance of Pseudolus the slave in 1966’s A Funny Thing Happened on the Way to the Forum. Jewison, however, felt that Mostel’s style, though perfectly suited for the stage, would’ve been too broad and unrealistic for film. He was absolutely right. Mostel was, of course, pretty disappointed with the decision; in fact, two years later, when Jewison directed the film version of Andrew Lloyd Webber’s rock opera Jesus Christ Superstar and wanted Zero Mostel’s son Joshua to play King Herod, Mostel’s reaction was, “Tell him to get Topol’s son!” Topol is a revelation in the part of Tevye, displaying a warmth and wisdom well beyond his years (only being 35 at the time). Indeed, he was rewarded with a Best Actor nomination for his performance. Much of the rest of the cast also comes from the stage and are uniformly good (including the Oscar-nominated Leonard Frey, Norma Crane, Molly Picon, Rosalind Harris and a “pre-Starsky” Paul Michael Glaser, billed simply as “Michael Glaser”). Jewison’s shrewdness extends beyond casting, however. Wanting to give the film an earthy “period” look (something that is commonplace now but back then was more innovative), Jewison and cinematographer Oswald Morris made the unconventional choice of shooting the entire picture with a stocking over the lens; it can even be seen in a sequence where Tevye is remembering his second oldest daughter as a little girl. Another brilliant decision on the part of Jewison was to get a relatively unknown composer named John Williams to adapt the music for the film. Most of the songs from the show are incredibly memorable (“Tradition,” “Matchmaker, Matchmaker,” “If I Were a Rich Man,” “Sunrise, Sunset”) but when Williams brings his intimate knowledge of the orchestra and bombastic personality to the melodies, helped in no small part by the virtuoso fiddling of the late Isaac Stern, the result is thrilling. Williams won his first Oscar (best adaptation score) for the work he did on the film, and it was a harbinger of things to come for the composer. The story to Fiddler is by now quite well known. In a little village in tsarist Russia called Anatevka, a close-knit community of Jews lives in safety and solitude, trying desperately to preserve their way of life in the face of persecution and socio-political change. This struggle is typified in Tevye, who finds himself constantly warring internally over what to do regarding his five daughters and whom they wish to marry. He expresses these struggles in numerous monologues, songs and prayers to God, usually in the form of an “on the one hand, on the other hand” debate. He often finds himself in precarious situations that he likens to the image of a fiddler on a roof, a musician who is trying to scratch out a pleasant, simple tune without breaking his neck in the process. By the end of the film, Tevye’s three oldest daughters are married (one to a poor tailor, one to a Marxist revolutionary and one to a Catholic) and everyone in the village is driven out by the Cossacks. 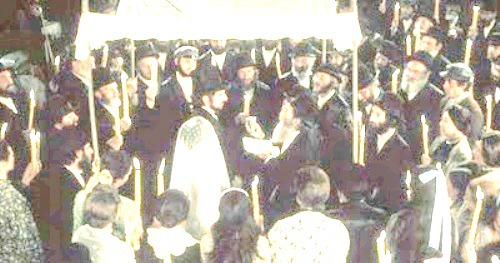 In the film’s final shot, Tevye invites the symbolic fiddler to follow him and his family to America, indicating that wherever the Jewish people go they bring their traditions, their heritage and their rich cultural and religious identity with them. Wonderful look at this musical. I recall an aunt & uncle of mine, who were big, big fans of the Fiddler stage play, were really disappointed when it was announced that Mostel wasn't going to be in the film adaptation. Yet, by the time they saw the film they instantly became Topol fans. Thanks, Damian. See, and I love Mostel too. He's hilarious in FUNNY THING and THE PRODUCERS and he was probably great in the stageplay (I never got to see for myself though I've listened to the original cast recording), but film is a far more subtle, realistic medium than theater and I agree with Jewison that he just wouldn't have worked. Topol was/is perfect. Zero was also excellent in a small supporting role for Peter Yates great, and somewhat forgotten, '72 adaptation of a Donald E. Westlake novel, THE HOT ROCK. He was a great actor. Wow. I've seen THE HOT ROCK and I don't even remember him being in it. I'll have to check it out again.